How do you implement a properly staged, milestone centric sales process so your sales people are reporting information based facts not just on hunches and feelings? What must you do the to define the correct steps in the correct order and more importantly, have your sales team embrace and follow the process? How do you transition from an outdated sales process to one that is intuitive, repeatable, logical, and that delivers a positive customer experience? 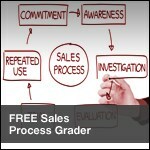 Why is it so hard to communicate and enforce a consistent selling process within your organization? We begin with the award winning OMG evaluation of your salesforce, analyzing the people, processes, systems, and strategies in place. Then we work with you to explain the findings and the impact of those findings and develop a process improvement plan. All process improvements are tested and vetted in a Beta environment before the roll-out of the new process The certified consultants that you work with have been in your shoes so they understand the real word challenges vs. theoretical or academic approaches. Improved ratio of proposals to closed business. Reduce the time and money you wasted in pursuing sales that never close. Accuracy of sales forecasting dramatically improved. Business intelligence developed from process statistics that were not possible previously. Your sales team becomes a synchronized, efficient, and predictable entity within your organization.